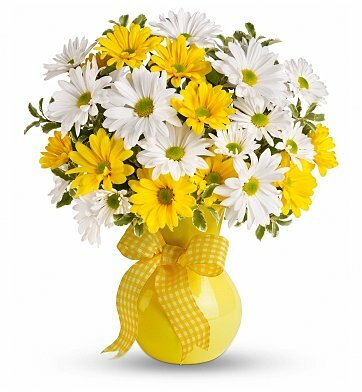 A bright, sunny arrangement of charming yellow and white daisies. Filled with water and ready to be enjoyed upon arrival. A free enclosure card with personal message. Delivered fresh to your desired location by experienced florists. During checkout, please be sure to indicate your preferred occasion when you choose an enclosure card. Daisy Delight Bouquet is a hand delivered gift. These gifts are delivered by one of our local design centers located throughout the United States and Canada. Same day delivery is available for most gifts when ordered before the cutoff time. The cutoff time for Daisy Delight Bouquet is 2 PM in the recipient's time zone. I ordered the flowers late morning and it was delivered after lunch. The recipient said the flowers were beautiful. I would definitely use this flower shop again! vase. Very pleased. What joy they brought to my sister who has been in the hospital for a month and half. We saw this bouquet today (August 20) when we visited a loved one in hospice. It was delivered on August 12 and is still as fresh as can be! Thanks so much for such a beautiful bouquet. Beautiful presentation and quick delivery!